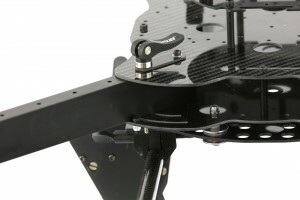 Whilst the UK might not be known for multicopter electronics, the industry here creates some superb carbon fibre frames, well known brands include CarbonCore and Vulcan. We have amongst our merry band of copters, a Vulcan Mantis in a hex configuration and a quad configuration, we rarely use the hex as it’s so large that transportation becomes a problem. However the release of the Vulcan Black Widow has got us excited, apart from the cool sounding name, it looks monstrously gorgeous, so we’re going to strip down our current Vulcans and give them a face lift with the new Black Widow frame. The Black Widow is suited to either a quad or x8 configuration and the arms collapse when unlocked for easy transportation, it’s a win, win!